Winter is at its peak here. The Sun and the fog seem to be vying with each other to show their strength to us. For the last few days, a thick blanket of fog has hugged us tight. The sonorous tinkle of drops falling from the leaves is the only sound audible in the otherwise silent morning. But all the days are not same. Yesterday, The Sun won the tussle and we had a sunny day. The Sun was mild and air chilly, but everything looked so positive and peppy. The warmth of the Sun infused life and vigour and made our world look bright and beautiful. Our bird bath started getting visitors and a female Koel had water to her fill. Later, a male Koel descended from the Mango tree and remained in the birdbath for some time. 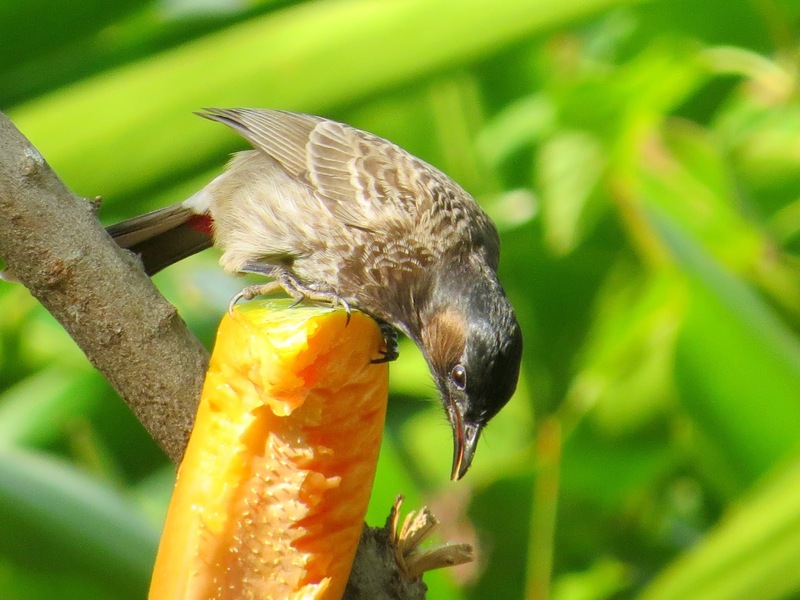 Earlier in the morning, a papaya that was sliced for the breakfast was found slightly unripe, It was put out on a branch for birds. A Red Vent Bulbul was the first one to make this delicious discovery. Somewhere around late afternoon, the Sun started losing strength and the fog descended. We headed indoors and started working on our Pretzels. Pretzels are the theme for this month’s baking of our group Bead Bakers. 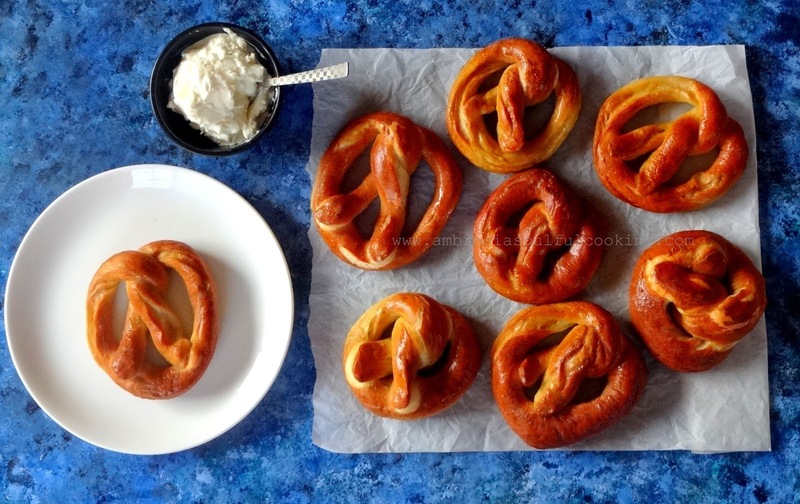 I had never baked Pretzels before and I thoroughly enjoyed the newness of the process. Shaping the pretzels was enjoyable. By late evening, very shiny, soft and chewy and fantastically brown pretzels came out of the oven. We had an early dinner and enjoyed the gorgeous Pretzels with cream cheese dip and pea soup. Pretzels are a yeast bread. 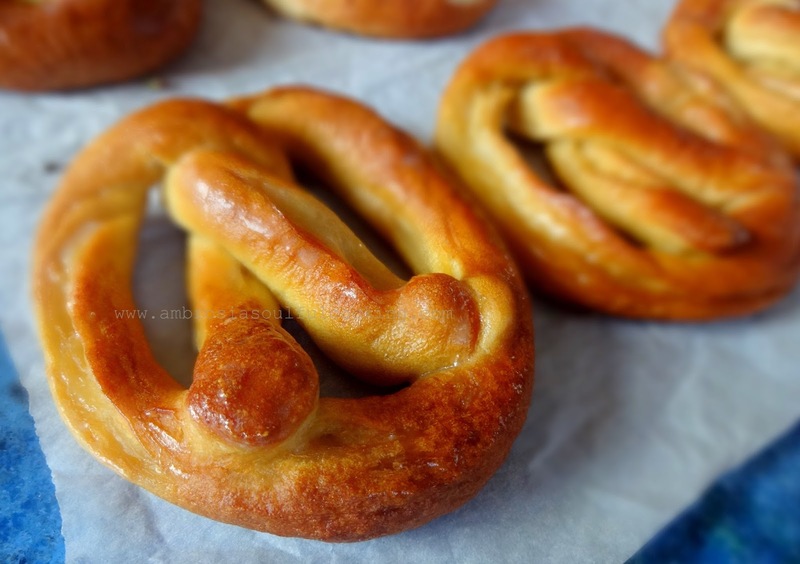 Pretzels are boiled in soda water and then baked. It is this “soda bath” that gives Pretzels a beautiful golden brown colour, a unique taste, and a chewy texture. In a measuring glass or a deep bowl, take water and sugar. Stir till sugar dissolves. Add yeast. Stir. Cover and leave for 10 minutes. Add water to flour mix and knead. 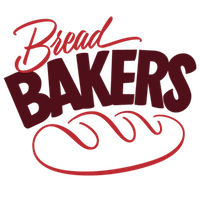 Knead for 6-8 minutes till you get a very soft, elastic and very smooth dough. Transfer dough to a greased bowl. Turn around once so that it is evenly coated with oil. Cover with a kitchen cloth and leave it in a warm place for 1 hour or until double. Take water in a deep pan. Add baking soda. Stir. Bring the water to a boil. Transfer dough to the counter dusted with flour. Roll out the dough and cut it into 8 equal pieces. You may weigh the dough and then divide into pieces weighing the same size. Line the baking sheet with a foil or a parchment paper. Grease the surface. 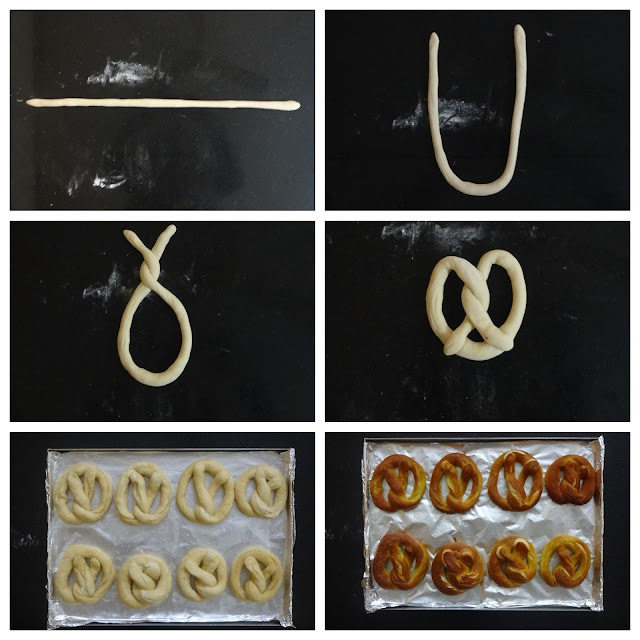 To shape the pretzels, work on one piece at a time. Cover the rest with a kitchen towel. Roll the piece into a 28 -30 inches long rope. Now shape it into a U with the two ends pointing away from you. Take the two edges and twist around each other a little away from the ends. First left over right, then right over left. Lightly moisten the two ends with water and then flip it towards the bottom of the “U” pressing the ends down. This is the classic pretzel shape. Prepare pretzels one by one and place them on the baking sheet and cover with a kitchen cloth. Now with the help of a slotted spoon, lift pretzels and gently put them in boiling water two at a time. Boil pretzels for 30 seconds. Turn over and boil for additional 30 seconds. Remove with a slotted spoon, drain, and place the pretzels back on the baking sheet. Repeat with remaining pretzels. Sprinkle some salt on the pretzels. Bake in a preheated oven at 220 degrees C for 8-10 minutes for until they are golden brown. Remove from the oven. Brush generously with melted butter. 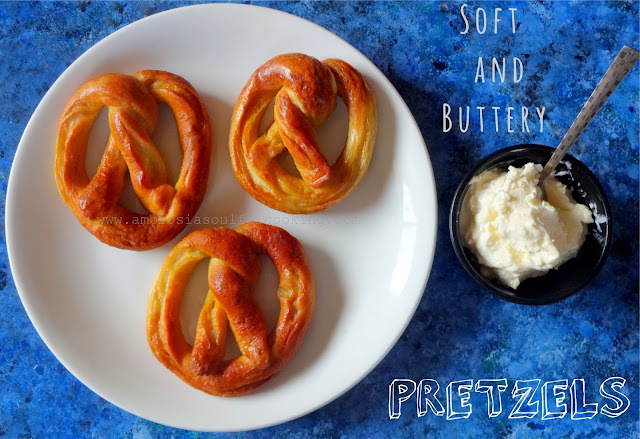 · Soft Whole Wheat Pretzels from What Smells So Good? As always, your posts make my heart sing Namita. That cream cheese dip sounds great. I could make a dinner of that and the pretzels with soup. I love your demonstration photos! Your pretzels are beautiful, and I love the idea of brushing them with butter. Such a gorgeous bake! Love the color you got there!!! Hmmm, pretzels with cream cheese dip and pea soup sounds like a perfect dinner to me! These pretzels look absolutely delicious and I just love seeing your pictures of the birds! 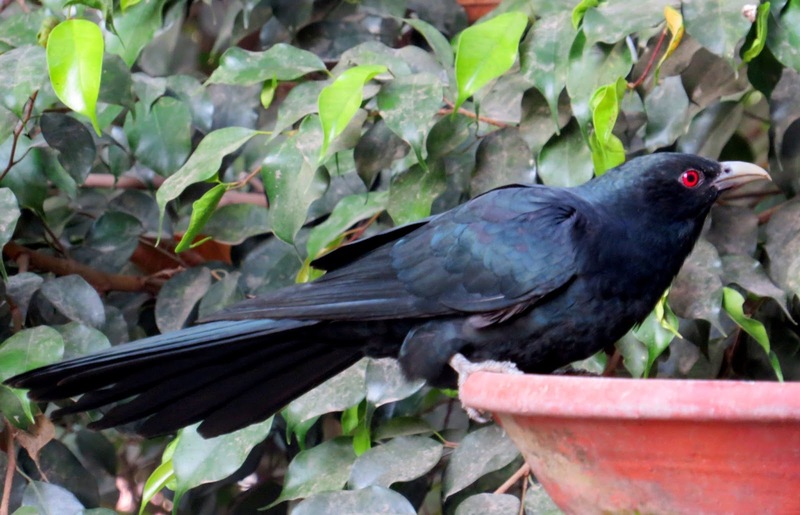 Aww love your bird pics, such a beautiful sight to enjoy in the morning. Lovely looking pretzels. They look soft and delicious. 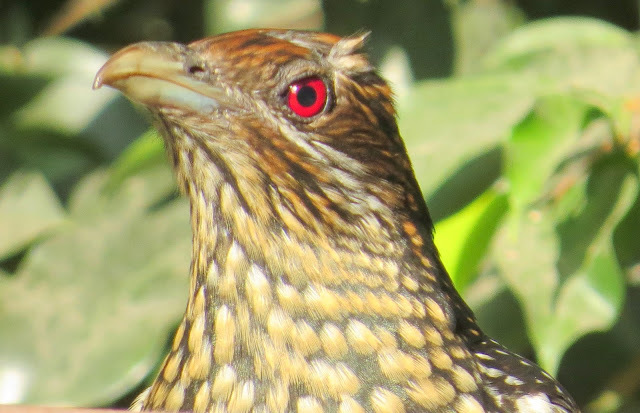 Those pics of the birds are just amazing.